Nia Coffey celebrates a successful play. The sophomore forward dominated the Wolverines, posting 25 points and 11 rebounds in a 63-62 victory. February has proven to be a lucky month for the Wildcats. 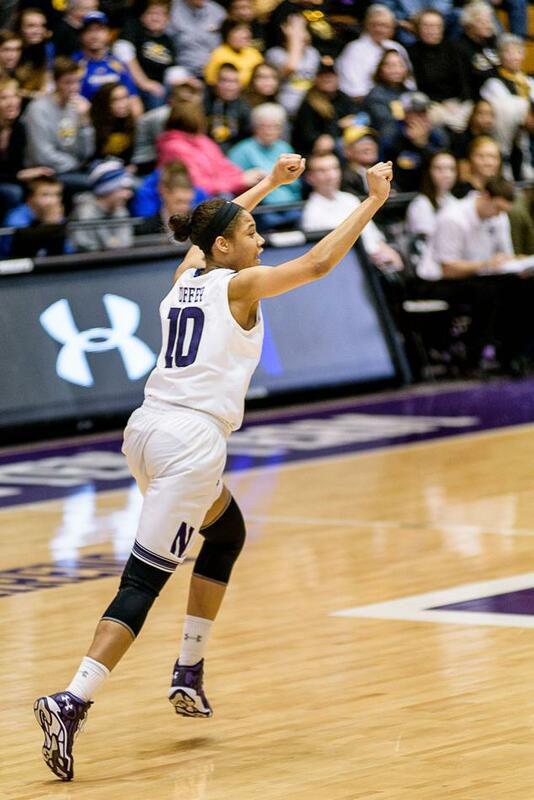 Northwestern (19-6, 9-5 Big Ten) extended its win streak to five in Ann Arbor, Michigan, on Saturday with a thrilling, come-from-behind win against the Wolverines (14-11, 6-8). Trailing by 1 with the clock ticking down, sophomore forward Nia Coffey snatched a rebound, dribbled down the court and made a layup with 4.9 seconds to go to secure a 63-62 victory for the Cats. It was the first NU lead of the entire game. Saturday’s contest marked the end of a nine-game, five-year losing streak against the Wolverines. NU got off to a shaky start, allowing the Wolverines to run away with the first 9 points of the contest. Senior Karly Roser, in her third consecutive start for the Cats, ended the Michigan run with a 3-pointer. Michigan would end up with a comfortable 13-point cushion late in the first half and take a 10-point lead into the break. The Cats shot well in the first half, netting 43 percent of their field goal attempts, but Michigan shot slightly better, making 47 percent of its shots. NU, a team that came into Saturday’s game top in the conference in turnover margin, gave the ball away eight times while Michigan only had five turnovers. The second half started off with a bang when junior guard Maggie Lyon swished a 3-pointer just 12 seconds into the period. Lyon has now made a shot from behind the arc in 30 consecutive games. The Cats began to slide backward again, eventually falling behind by a margin of 12 points early in the second half. Then, NU began to launch a counterattack. The Cats went on a spirited 15-3 run over the next four minutes and 17 seconds to tie the game at 51. Michigan and NU traded points over the following minutes, with the Wolverines staying just slightly out of reach. Down by 3 with 27 seconds left, Lyon grabbed a huge defensive rebound. After coach Joe McKeown called a timeout, junior guard Lauren Douglas was able to bank a layup, making it a 1-point game with 18.6 seconds to go. The Wolverines missed four consecutive free throw attempts to keep the contest a one-possession game. Coffey grabbed the rebound from the last Michigan free throw, ran down and threw up a layup, giving the Cats a 1-point lead with 4.9 seconds to go. Michigan regained possession and took the ball down, but its last-second shot fell short of the basket. Coffey tallied 25 points and 11 rebounds Saturday, earning her fifth consecutive double-double and 12th of the season. Lyon and Douglas joined Coffey in double digits, scoring 12 points apiece. McKeown said the win exemplified NU’s perseverance.